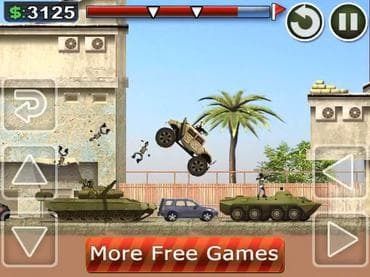 Stock up on ammo and gas up the Hummer, you're guiding Special Ops on a blitzkrieg patrol in this action race game. Stock up on ammo and gas up the Hummer, you're guiding Special Ops on a blitzkrieg patrol in this action race game. Take no prisoners as you traverse and explore this war ravaged landscape. Tanks, choppers, and enemy fire are everywhere, but they are no match for your fortified military assault vehicle. The more enemies you run over in this race, the better. Your score is based on body count. It is up to you to successfully complete a patrol and return to base. One wrong turn and you can easily fall into enemy hands. The Hummer is a fortress, but overturned it can erupt into a towering fireball. Detailed graphics and a high-octane soundtrack combine to illustrate the powers and pitfalls of war. It's time you showed your country what you are made of. Play this free racing game today and proudly wave your victory flag. If you have questions about Spec Ops Race game, please contact us using this form.